New England Contractor News - Should I replace my Thermostat? Newer thermostats have programmable settings for daytime, night and weekend settings. Installing a new thermostat and correctly setting it can save you hundreds of dollars in heating and cooling costs per year, and make your home or office more comfortable. I've heard it will save a lot of home heating fuel. Boston, MA - a homeowner recently asked if they should replace the thermostat in their home. They had owned the house for over ten years, and wanted to know if it would do any good to change the thermostat since the heating system itself was and older system. The short answer: Updating an older thermostat will save a lot of money. A home heating system thermostat's job is to turn the heater on (and off). It accomplishes the job by measuring the temperature in the house, and if the house temperature is colder than the temperature set on the thermostat, it turns on the heating system. Once the temperature comes up, the thermostat turns off the heater. New computerized home heating thermostats are much smarter than their old mercury tilt and coiled metal spring ancestors. In the old days, a metal coil would expand or contract, and on the end of it was a mercury tilt switch. When the coil contracted enough to tilt the switch, it kicked the heater on... the heater would run for a while, the coil would warm up and expand and tilt the switch back, turning the heater off. Many older thermostats only allow you to set the system at one temperature, then it maintains the house at the temperature all day and night. Note; some thermostats are also connected to your central air conditioning system, and will turn the A/C on and off to cool the house when the temperature is above the one you've set. The newest types of thermostats allow you to program up to 4 different time and temperature settings per day, and to program it for M-F, Weekend, Vacation, and Custom settings. By programming your thermostat to only heat or cool the house at times when you will be awake and at home you can save a significant amount, (10 to 20 percent of your annual home heating bill!). If, in the course of the year you use 1200 gallons or home heating fuel, and you save only 2 percent, that's 24 gallons. If the fuel costs $2.00 per gallon, you've just saved $48.00 in one year. Mutiply that over the course of 10 years, and this simple home improvement can easily save you $480.00 or more! By lowering the temperature significantly while you're sleeping or away, you are lowering the average maintained temperature. For each degree of "AVERAGE MAINTAINED TEMPERATURE" you will save 2 percent of your annual heating costs. In fact, you can easily save thousands of dollars by properly programming your new thermostat! If, prior to installing a new thermostat, you had an old single setting type and kept it at 70 degrees, running a program like the one in table (above) would reduce the cost of fuel as if you had lowered the temperature to (approx) 67 degrees. The difference is that your house will be at 70 degrees in the morning and evening and when you are at home, and cooler when you are not home or sleeping. One thing that is not apparent immediately when you install the new thermostat is that it learns how your home heats and cools, and adjusts itself to optimize efficiency. By detecting how long it took the heating (or cooling) system to come to temperature, the thermostat will adjust itself in the following cycle to cause fewer spikes and drops in temperature. As weather changes and the need for winter heat changes to a need for summer cooling, this can not only save you money, but make your home more comfortable. 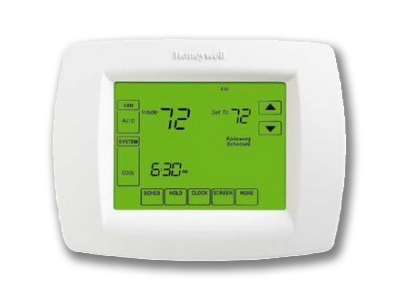 If your thermostat is a single setting, single temperature type, or one of the early multi-time, multi-temperature but mechanical types, we highly recommend installing a new microprocessor controlled multi range setting thermostats, or having a contractor install one for you.